John Mulaney Returns With 'Kid Gorgeous' Netflix is churning out comedy specials almost as fast as you can watch them — maybe faster. In the latest, John Mulaney tries to wrap his head around the state of the world. Netflix is doing a volume business in comedy specials. Just since the start of 2017, they've had specials from Trevor Noah, Patton Oswalt, Ricky Gervais, Chris Rock, Dave Chappelle, Maria Bamford, Sarah Silverman, Amy Schumer, Jerry Seinfeld, and Marc Maron — and those are just the ones with the higher profiles. (Side note: A lot of Americans aren't familiar with English comedian James Acaster, but if you're looking for something to try, make it his four-part piece Repertoire.) As with drama, comedy, animation and everything else, Netflix is now flooding the zone, as it were, throwing massive piles of money at massive quantities of programming, to the point where it's hard to keep up. But I never miss a John Mulaney special. Mulaney is a favorite comic of mine, which means I have exhausted his 2009 album The Top Part, his 2012 album New In Town, and his 2015 Netflix special The Comeback Kid. Along with those pieces, he's done the play The Oh, Hello Show with Nick Kroll, had other acting and voice work, and even had a brief and unsuccessful sitcom that, happily for all involved, was instantly memory-holed. He stays busy. His new Netflix special, Kid Gorgeous, drops May 1, and it was taped on the enormous stage at Radio City Music Hall. At first, Mulaney seems a bit dwarfed by the location, both physically (one person on that stage looks tiny) and substantively (playing to the huge room makes him seem, at first, a little frantic and hollering, even for a comedian). It's nowhere near the largest venue comedians play — these days, they play arenas all the time. But perhaps playing an arena that's big enough becomes almost a performance on the hanging screens, while Mulaney is heroically trying to make himself effective for the back row, which is far away. The first half of the special seems a little slow in general, with segments that are too long for the amount of meat that seems to be on the bone. But somewhere around the middle — somewhere around a Mick Jagger impression, which sounds terrible but isn't — it takes flight. After that, it's very good. 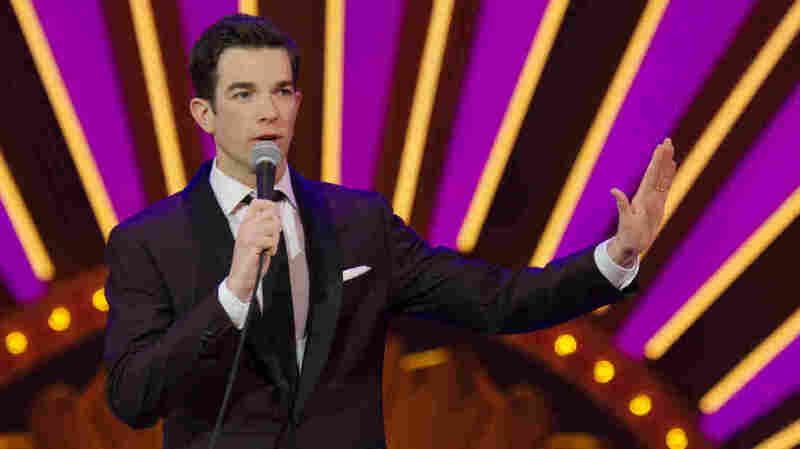 Mulaney is not primarily a political comedian, but the part of the special that deals with politics is based on a simile he's been using for a while, that the current administration feels to him like having "a horse loose in a hospital." What follows is less a series of jokes about politicians than a series of jokes about reading the news in a chaotic environment. And that part is genius. I worry a little about the proliferation of these specials. When comedy first landed on basic cable, there was a lot of hand-wringing about the way television devoured material, and Netflix is a gaping maw that sometimes seems determined to stuff itself until either it keels over, broke, or it stomps everybody else until they're flattened — also broke. Until then, step right up for the most detailed explanation of what it's like when there's a horse in a hospital that you're ever going to hear.